Emes Ve-Emunah: Do Poverty and Violence Glorify the Torah? Do Poverty and Violence Glorify the Torah? The latest Adopt-a-Kollel ad speaks more eloquently about the poverty in the Charedi world than I ever could. The situation is so bad that there are families that literally have no food. Not for the parents and not for the children. How, that ad asks, can you look a Rosh Kollel in the eyes when he says he has 12 children at home and cannot feed them breakfast? While this ad is designed to get people in America to fund Kollelim in Israel, the plain fact is that whatever one believes about how terrible the extreme poverty in the Charedi world is, they can be sure it is even worse. The ad says that the Avreichim do not complain. They chooses a life in Kollel and are willing to sacrifice. That may be fine for them. Their wives might even be fine with it. But what about the 12 children a typical Avreich in an Israeli Kollel has? Are they all fine with it? I am not a fan of the Adopt-a- Kollel campaign. Not that I think we should God forbid let them starve. But not in a way that perpetuates the system that causes it. In any case, there is no way that this program can sustain a Hashkafa that directs virtually all of its male members into this impoverished way of life. While there may be some Kollelim that will benefit, the majority of Avreichim will not. There just is not enough money generated by this program to fund every Charedi family in Israel. Now it’s true that not every Charedi family lives under such dire conditions. Some have support from parents. There are some wealthy benefactors that fund free loan societies to the tune of millions of dollars. And Charedim themselves help each other. I have been told for example that whenever there is any amount of money in any kind of savings account, it is taken out and ‘loaned’ to a Gemach which they of course use to feed the less fortunate. These Charedim are an idealistic bunch. Willing to give every spare penny to help the poor of their community. And yet we still get a story like the one in that ad. Obviously things are pretty bad and can only get worse. I am not going to dwell on the answer I think will really help – since I harp on it all the time. But unless there is a paradigm shift that praises rather than disparages the work ethic and allows some sort of preparation for that in elementary and high school - we will be hearing more and more stories like that. I doubt that there is a single Charedi leader that will even entertain that notion. Talmud Torah K’Neged Kulom means not only that it is the most important thing a person can do. It is the only thing he can do. At least as a first option. Even if he is better qualified to serve God doing something else, he should at least try to do that first. Without the distraction of preparing to make a living. The mindset is then created that sacrifice to do that to the point of extreme poverty is the optimal choice for all. So what has this mindset produced beside poverty? It has produced a sense of superiority so grand that Avreichim feel entitled to ignore their responsibility as citizens of their country, Israel. They believe they have a right to be absolved of any service to their government even though everyone else is not. Talmud Torah K’neged Kulom means that they have only one responsibility – to learn Torah. Any attempt to diminish that by anyone is seen as Shmad - forced apostasy. The government is therefore characterized as Amalek. So there is a reaction to any kind of required national service. That requirement includes registering for a future draft. The more moderate factions follow a Gadol like R’Shteinman who has called for peaceful resistance. 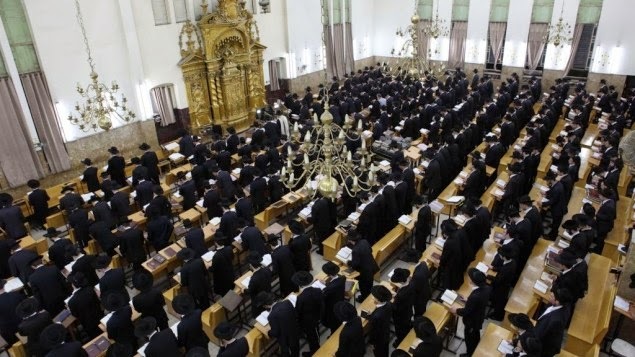 R' Shteinman has asked Yeshiva students and Avreichim to comply with the current law and register. The actual draft (should that remain the law) will begin in a couple of years and will be dealt with at that time. But the extremist faction of R’ Shmuel Auerbach does not believe in compromise. R’ Shumel has called for active resistance and protest and asked his followers to refuse to register even if the consequences are jail for failing to register. (My guess is that his strategy is to fill the jails with young students which will make the government look bad internationally - forcing them to rescind the law). The latest manifestation of this dispute happened in the city of Ashdod where 40 Charedim were arrested during an anti draft rally. But that was nothing compared to what’s happening in Bnei Brak. A brawl erupted at the Ponevezh Yeshiva, where a prominent rabbi, Shmuel Markovitz, was physically assaulted by a student of a rival faction, sparking the violent confrontation between the two groups. Markovitz’s students, who refer to themselves as “the Mehablim,” a Hebrew word that connotes either terrorists or saboteurs, then stormed the yeshiva dormitories of their long-time rivals, “the Sonim,” or “the haters,” and a full-blown fight broke out. The students vandalized dorm rooms and hurled furniture at one another, and a canister of tear gas was released in the compound. Ambulance workers said dozens of people were injured and 13 were hospitalized for tear-gas inhalation. Is this really the kind of ‘Torah’ the world should be supporting? Are these students the future recipients of Adopt-a-Kollel funds? To the best of my knowledge - what’s happening in Ponevezh is not happening at other Yeshivos. But at the same time, when a premiere Yeshiva like Ponevezh – a Yeshiva that in the past has set the standard for the Charedi paradigm of Torah study; a yeshiva whose leader for decades was Rav Eliezer Menachem Man Shach, ZTLwhom many considered to be the Gadol HaDor - generates this kind of behavior, one has to question its ultimate value to Torah and to Klal Yisroel. Despite the likelihood that it will not happen, I hope the Charedi leadership examines whether their current paradigmatic efforts truly produce the desired outcome. The outcome God wants of His people as expressed by the prophet Isaiah (42:21) ‘Hashem Chafetz L’Man Tzidko, Yagdil Torah V’Yadir’. Is this glorifying the Torah for the sake of God's righteousness? If the level of poverty doesn't do it, then the Chilul HaShem that Poenvezh now is - should!